Shoulder dislocation is a painful injury. It is common among athletes and may result from a fall or other trauma to the joint. Because the shoulder is a highly mobile joint, it is also at risk for easy dislocation. partial dislocation or subluxation – caused when the top of the humerus bone is partly out of the socket. complete dislocation – when the top of humerus comes completely out of the socket. The shoulder can dislocate downward, backward or forward. Any combination of the above symptoms can mean a dislocated shoulder. It is best to have your shoulder examined by an orthopedic surgeon. Whether your shoulder dislocation has happened for the first time or it is a repeat injury, it is important to have it diagnose and treated right away. The surgeon will be able to restore the joint into the correct place and provide immediate relief. This process is known as a closed reduction. Afterwards, your doctor may refer you to a physical therapist in order to help the joint become stronger and prevent future re-injury. This entry was posted in blog on October 24, 2018 by david@ogrelogic.com. The rotator cuff is a group of muscles and tendons around the shoulder joint. They keep the head of the humerus (upper arm bone) secure in the shoulder socket. A shoulder injury can affect the rotator cuff, causing a dull ache in the shoulder, which may worsen when sleep on the affected side. A rotator cuff tear is a common injury, in sports such as baseball, or in jobs such as cleaning windows. It can occur due to age-related wear and tear or overuse and repetitive motions. Your rotator cuff may also get injured if you fall on your arm or lift something heavy. A rotator cuff tears can be partial (when the tendon is frayed) or complete (the tendon is pulled off the bone). Left untreated, a torn rotator cuff can lead to a frozen shoulder or arthritis which is harder to treat. Surgery may be required in some cases, especially if you have a complete tear. Surgery can be done to stitch together the torn area or reattach the tendon to the bone. This entry was posted in blog on September 26, 2018 by david@ogrelogic.com. Comminuted Fractured Treatment – How is it Beneficial to Patients? Are you clumsy? Do you easily fall or break bones? Getting older and your bones seem to be brittle? Middle of the night, hospital visits are your norm? Typically, we would relate this to the elderly or those with brittle bone (osteoporosis), but it can happen to anyone. I can honestly say, I have never fractured anything or had to seek long-term treatment for bothersome ailments. Tons of Americans want quick fixes and to feel pain-free immediately. I prefer the proper care and treatment for safer longevity and stability. Every bone in our body has the potential to be broken, fractured or dislocated. There is a treatment that trained doctor’s use and you must do so very carefully and wisely. Comminuted Fracture Treatment is much more complicated than normal fracture breaks because bones are severed in three or more fragments. 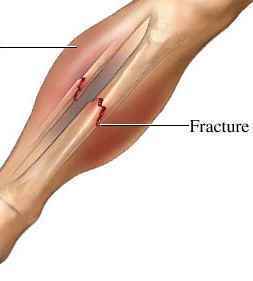 Communized fractures are put under a lot of pressure and eventually end up being severed in several places. Surgery is usually imminent. Risks could impose major complications and treatment tends to be tricky. Surgeons need to rehabilitate every broken piece of bone and will use screws or specially made cement to fuse pieces together. If the bones do not require a surgical procedure – readjustment might be possible. Get proper rest and try to keep the pained area stable, elevated and free of movement until it is healed. Your goal should be to regain strength and get back to normal. Prescribed Pain Medication will be needed in some cases as deemed necessary, but not expected. Often pain is unbearable, and a script is needed for soreness, throbbing sensations, and agony (at times). Caution getting addicted to pain medications, overusing them, and having to up your dose for pain relief. Why do Comminuted Fractures occur? Accidents cause most of the fractures that specialists see. There must be a great amount of pressure such as experiencing a massive car crash or gunshot wound. Individuals with Osteoporosis (weak bones) or cancer can fracture body parts easily in several various places. As adults get older, bones deteriorate and the decline in strength makes a quick fall traumatic. Athletes occur in people who play more than one sport (typically) as this increases their risk of injury. Therapy and treatment guides us through significant changes that eventually improves our lives in new miraculous ways. I believe our staff to be the best in the industry and work tirelessly to put you back together, one piece at a time! This entry was posted in blog, Hip, Knee and tagged Ankle Fractures, Comminuted Fractured Treatment, Hip Fractures, Osteoporosis on September 13, 2018 by aenriquez. Living with pain is not an option many are willing to tolerate, especially when life becomes unbearable and debilitating. There are many treatment options that are available to our patients, highly effective and will get you on the road to recovery, quickly. Knee pain is very common and treatable. It is easy to diagnose why you have pain, but it takes a skilled physician to determine which treatments are best for healing. Knee injuries occur in people who are athletic, play sports, have degenerative arthritis, osteoporosis, or a shocking life event (like a car accident). Knee Arthroscopy (Knee Scope): Minimally invasive surgical procedure, where a highly trained surgeon will shave soft tissue or repair and reconstruct ligaments and cartilage. Meniscectomy: most commonly used with a knee scope, where torn cartilage in the knee is shaved to alleviate knee pain. Partial and Total Knee Replacement: one of the most successful orthopedic surgical procedures in treating your damaged knee, due to post-traumatic arthritis or inflammation. Partial knee replacement is beneficial to those patients who need only one part of the injured knee replaced. Cartilage Regeneration: cushions the knee to allow for painless mobility. Articular Chondrocyte Implantation: biopsy is taken to evaluate the cartilage in the knee, arthroscopic surgery is then performed to implant cartilage into the defect to heal. Osteo Transfer Surgery: cartilage from a healthy area is taken and is moved to the damaged area in the knee. Microfracture Procedure: an arthroscopy procedure used to stimulate new cartilage growth. If you cannot actively participate in sporting events, athletics (such as weight lifting or running) due to pain, then we recommend giving this treatment a try. We warn all patients that this procedure may not last long term. DeNovo Natural Tissue Graft: used in the specific treatment of articular cartilage defect. This is one of our newest methods of rejuvenation and healing, where a donor’s juvenile cartilage is used. An outpatient procedure where donor tissue gets inserted into the defected area and molded with fibrin glue. Orthopedic Bracing (Orthosis): is a medical device, with various functionalities. Sometimes it is used to reshape the body or hinder any mobility of a specified part of the body. The orthopedic brace is also used to take the weight off the injured area. Steroid Injections: injecting medication into your knee will remove negative symptoms. The drugs work through your joints ( pained area) and work immediately. Inflammation tends to decrease within 24-48 hours but used for short-term relief only. We offer the utmost quality care, with trusted experts, who want to see you 100% healed and healthy. We will find where the pain is located and take actionable steps in correcting it. Let us help you find the right treatment solution, for your specific injury. This entry was posted in blog, Knee and tagged arthroscopy procedure, articular cartilage defect, knee pain, Knee Treatment on September 5, 2018 by aenriquez.